The US housing market took a dark turn in 2018, as homebuying fell off a cliff and mortgage lenders saw a steep decline in applications, originations, and profits. Significant housing declines have foreshadowed nine of the 11 post-war US recessions, according to UBS. As 2018 headed toward its close, Americans' appetites for buying homes fell off a cliff. In December, the rate of existing US home sales cratered to 4.99 million, 10.3% below the mark from the year-ago period, according to data released earlier this week by the National Association of Realtors. The decline has been broad, affecting every region in the US. Even home sales in the the posh Hamptons got battered in 2018. At two of the largest bank mortgage originators and servicers in the US, the numbers were more pronounced. At Wells Fargo, mortgage banking revenues fell 50% to $467 million in the fourth quarter, while originations declined 28% to $38 billion. JPMorgan, meanwhile, saw mortgage income fall to $203 million, a 46% drop from the same period last year. Originations fell 30% to $17.2 billion. These ugly housing numbers have raised red flags for Wall Street investors and analysts, who are concerned that "the deterioration in housing and its intensification since mid year raise the possibility of underlying weakness in the household sector," according to a note issued this week by UBS economists. It's too soon to head to the panic room, as this trend could prove a small bump that smooths over throughout 2019, but a deeper drought in housing is dark news for just about everybody, not just the banks. Significant housing declines have foreshadowed nine of the 11 post-war US recessions, according to another note by UBS from December examining the housing slowdown. "The housing market usually does not slowdown in a vacuum and a falling housing market may well be the first indication of broader economic weakness," the bank's analysts wrote. The US economy has been exceptionally strong the past year - we've had wage growth, low unemployment, and low delinquency rates, among other positive drivers that should auger well for real-estate investing, UBS notes. So what happened to the housing market? The most glaring explanation is that mortgage rates increased, convincing prospective homebuyers the market had become unfavorably expensive. The Federal Reserve hiked its benchmark interest rate four times in 2018; the rate on a 30-year mortgage hit 4.94% in November - the highest mark since 2011 - before falling down to 4.45% by year's end. That November figure may not seem a gigantic increase from the average rate of 3.65% just two years ago, but for a $250,000 home, the difference in the monthly payment is $190 and the lifetime cost is greater by nearly $70,000. But interest rates don't tell the full story - UBS analysts estimate rates account for roughly half of the slow down. Home prices have also been ascending for years. The median existing-home price in December was $253,600, a 2.9% increase from 2017 and the 82nd straight month of year-over-year gains, according to NAR. "We saw a cooldown because buyers couldn't afford these homes anymore," Daryl Fairweather, chief economist at real-estate brokerage Redfin, told Business Insider. Cash-strapped and saddled with student loans and other debts, millennials - a generation of more than 70 million in their 20s and mid-30s - have delayed buying a home later than their parents, but their participation is crucial to buoying home sales. "They need to be in the housing market to keep things going, but they face real affordability challenges," said Jody Shenn, a VP in structured finance at Moody's. "Just being able to get a house they can afford on a monthly basis with a mortgage is on the challenging side at this point." But the debt-burdened millennial didn't materialize in 2018. 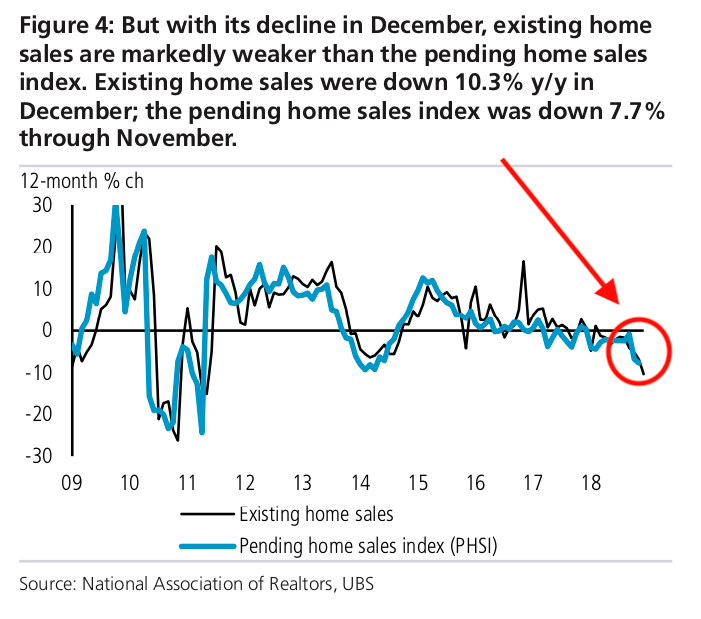 That long-standing trend is likely contributing to the overall slowdown, though it doesn't necessarily explain the precipitous drop in fourth-quarter home sales. Other factors that may have had an impact but are harder to pin down: rising construction costs, a reduction in the mortgage deduction in the new tax law, tightening credit standards by some lenders, and less flexibility in underwriting. Curiously, despite less homebuying demand and falling revenues, the rate of mortgage and refinancing application rejections also shot up in the second half of the year, according to data from the Federal Reserve Bank of New York. In its "Credit Access Survey" - a quarterly report on US borrowers - the Fed found in October that even as mortgage applications among those surveyed fell from 9.2% to 6.7% over the previous year, the portion of respondents who experienced a mortgage application rejection increased from 15.6% to 19%, the highest mark in the survey since February 2015. Two Moody's analysts Business Insider spoke with said they hadn't noticed tightening lending standards for residential mortgages. Home-lending standards have actually been loosening of late, they said. Charge-offs have been on the downswing, though, suggesting lenders have been doling credit out responsibly in recent years. But it could still be the case that lenders experienced an influx of applications from borrowers they deemed too risky to lend to. The Fed has telegraphed its rate hikes, so savvier and more credit-worthy borrowers may have taken action early on to get a cheaper mortgage rate. Borrowers applying at the peak were "probably more desperate," according to Fairweather, and banks don't typically like to lend to people in desperate situations who have a higher chance of defaulting on their loan. Riskier borrowers may have grown more interested in buying a home, but in general the number of consumers who think it's a good time to buy has been declining since 2014, according to surveys from the University of Michigan and Fannie Mae. The number of consumers who believe it's a favorable time to buy a home has fallen below the number who think it's a good time to sell a loan - a foreboding signal. As UBS points out, that's only happened twice in the 26 years those survey questions have been asked - and those instances preceded our two most recent recessions. There's no quick fix for consumers feeling stretched too thin to buy a home, according to Kornfeld and Shenn at Moody's. Costs and rates have to fall, or wages need to increase, or some combination thereof. Mortgage lenders face a bleak horizon this year. Their profit outlook fell for the ninth straight quarter and reached an all-time low to close out 2018, according to Fannie Mae's Mortgage Lender Sentiment Survey. Consumer spending hasn't flatlined elsewhere, and as previously mentioned, unemployment and wage growth are trending in the right direction. Fairweather anticipates another strong year for the economy in 2019, and she's optimistic that buyers will have an easier time and more leverage in negotiations this year. Still, amid a steady housing decline and following the especially ugly numbers from the fourth quarter, analysts are on alert, and UBS says it will be tracking the trend closely this year.